Streamline your design workflow with these time-saving updates. Adobe has today announced a raft of time-saving updates in Adobe XD CC 2018 that sees the all-in-one UX/UI app work more efficiently with Photoshop CC and rival app Sketch. Now, you can import Photoshop and Sketch assets directly into XD, with files automatically converting to XD files. This makes it possible to create interactive prototypes more quickly. In addition, you can also now copy and paste symbols between XD documents in one simple step. Previously, they needed to be converted manually. Elsewhere in Adobe XD, you can speed up your design process by styling grouped elements – this includes changing properties like the fill and stroke of grouped elements. 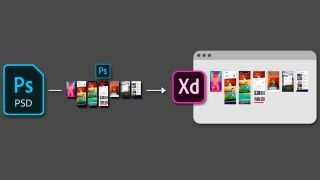 And a scrolling artboard enhancement tops off the latest Adobe XD update. When prototyping, you can now edit the viewport of a scrollable artboard right on the canvas itself without having to exit and go to the Property Inspector. The result is a faster and easier prototyping experience. Described by Adobe as part of its "commitment to working with the design community", the powerful updates are the latest example of the company actively listening to and implementing highly requested user feedback. Back in January, Adobe XD CC made initial steps to create seamless workflows by integrating Dropbox and other popular UX tools. Meanwhile, Adobe has also released a batch of new features in Illustrator CC and InDesign CC. In Illustrator, you can now import multiple PDFs as artboards; increase the size of anchor points, handles and bounding-box controls; and data merge with CSV files. Over in InDesign, you can now deploy Photoshop or Illustrator shortcuts, merge multiple paragraph borders, and see more detailed analytics for documents they published online.